As designed by Wolfgang Kramer and Horst-Rainer Rösner, Tycoon is a business game for three to four players (and a playing time of about 75 minutes) of building hotels and factories in nine different cities. 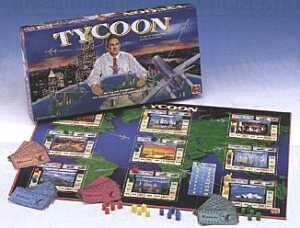 Each player starts the game with an airplane, six hotels, five\ factories and $15 million in starting capital. The game consists of three paydays, each triggered when one player has built his 7th, 12th and 18th house. Before dismissing Tycoon as being yet another variation in the Acquire genre, note that it has several novel mechanisms and twists that mesh together quite well to produce a unique gaming experience that is very worthy of its 1998 German Game of the Year nomination. In Tycoon, players purchase airline tickets of two varieties: expensive direct schedule flights to or from the named city or less expensive charter flights between two cities. The more expensive direct flight tickets may also be used to move a space (or more) around the board giving a player greater flexibility in movement (and justifying their additional cost). Two of the direct flight tickets and six of the charter tickets are turned face-up. On a player’s turn, he can buy as many tickets as finances allow. Tickets are then replenished in the same 2/6 ration. The player then can stay put and erect a hotel or factory there. There are only two landing spaces at each city; if the first one is occupied, the second player is forced to spend more to build a hotel or factory at that site. As hotels are added to a city, payoffs for first and second place buildings (i.e. the number of hotels) increase and eventually decrease. (The economic concept of diminishing returns is finally realized in a boardgame.) When a key red space is covered by a hotel, the first hotel built in the city must be “renovated”. Renovation results in the hotel moved off the track (placed in the city “center”) so that it no longer counts towards ownership of a chain in the city. To put the hotel back in play, the player must eventually fly back to the city which allows him to place that hotel, for free, on the next available space in the chain! Factories are more expensive than hotels but guarantee a second place payoff on each payday and first place payoff if the factory is built in the city with the longest hotel chain. Players receive six hotels per round but have only five factories for the entire game. Money in Tycoon is very dear. The starting capital is totally inadequate for both building six hotels (and/or factories) and buying airline tickets. As a result, one must fly off-board to one’s home bank to take out small ($10 million) or large ($16 million) loans. Returning to the board requires an expensive direct flight ticket. In our playtesting sessions, all our players have concluded that taking out a loan on your first turn is virtually mandatory. When one player has built his sixth hotel, it’s payday. The other players who have yet to complete that round get one more turn, ensuring that everyone has had an identical number o turns. We’ve added a rule: rotation clockwise of the first player for each round to partially negate the advantage of being last in a round. Each city is then scored by paying the player with the most hotels in a city the bonus for first place with second place earning roughly half as much. Factory bonuses are then paid in the same fashion. The final payout is for diversity. Players get increasingly more money for each city where they have hotels (according to a chart on the game board). Loans are then repaid (or rolled over at a greater cost) and each player receives six more hotels. After the third payday, all remaining loans are repaid and players add up their remaining money. The richest player wins!